Researchers found that only a third (34 per cent) of calves achieved adequate colostrum status. New research suggests neonatal calves may be at risk of lowered immunity due to poor absorption of colostral antibodies. Researchers from Moredun and Norvite explored the relationship between diet and neonatal calf health on eight farms. Previous research by University College Dublin has shown over-supplementation of iodine in ewes during the pre-lambing period can cause failure of passive transfer (FTP) of colostral antibodies in newborn lambs, with detrimental effects for their immunity. However, this had not yet been demonstrated in calves. Moredun and Norvite researchers carried out a survey of iodine supplementation on farms from Orkney to Lanarkshire. They found large variations between farms in the contribution of forage to iodine intake, highlighting the importance of farms carrying out annual forage analysis before consulting a nutritionist on mineral supplementation. Colostrum uptake was estimated in a sample of 70 calves using zinc sulphate turbidity (ZST). Researchers found that only a third (34 per cent) of calves achieved adequate colostrum status (ZST level of 20+), while 13 per cent were in the danger zone for complete FPT (ZST <5). According to the findings, farm six, which had the highest iodine levels, had the lowest mean ZST levels and had a history of neonatal calf disease. Meanwhile, farm seven, which had the lowest iodine levels, had the highest mean ZST and was the only farm to have no calves in the FPT danger zone. 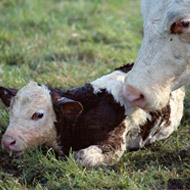 Farmers struggling with neonatal calf disease were urged to speak to their vet about checking antibody absorption in a selection of calves under a week old this spring, and to contact a nutritionist to carry out forage analysis and mineral budget for the in-calf cows for the following year.